I got my copy of Philip Brown’s new book, “Cosmic Trends” and the first page, the acknowledgments made me cry! I figured this was a good sign. Because I’m terrible snob when it comes to astrology books. I have read a lot of them. 300 of them? 500? I don’t know. Something like that. And I hate to be bored! And there are several ways not to bore people, but the best way is to be a human being! I want to have a feel for the writer. And a lot of astrology books seem to have been written by some kind of machine. These books can be technically great, but who can suffer through them? Not me! Not these days anyway. I’ve paid my dues. I can read a chart. So at this point I have a very high standard. So this is Philip Brown’s first book. And when I read the acknowledgments and the bit about his wife and daughter made me cry… well, obviously there is a human being writing, here. Hooray. He reveals himself. And it’s nice to have a page in there about Pluto being demoted as a planet. It’s so fresh! This book is hot off the presses. It is very now. In the introduction he says the average American sees 16,000 advertisements, logos, and labels in a day. And he promises to demonstrate how astrology can help “make sense of this fragmented world and the warp-speed changes taking place around us.” He says he is going to tell me when the tide is coming…when I should move my beach blanket. And I like his premise, don’t you? It’s a good idea. You can show me a way to order this mess? You can give me some insight? Bring it on. So this was my initial impression reading the introduction. That he’s got a lock on something; he’s researched his subject and has something authentic he is going to convey. And does he deliver? He does. I was very curious to see what he would do with the enormous subject he’s opted to tackle and if you are interested in the collective trends this is the book to buy. He covers everything from fashion to identity theft to quarantines and mass vaccines! He writes about tomorrow’s diseases. This is a book of predictions, but with a backbone. Astrology gives the book form and distinguishes it from something a “psychic” might publish with their predictions for the future based on nothing. And Phil Brown has done something very innovative here in a world where most astrology books are repetitive. The same stuff is repackaged over and over and often inferior to the book that came before. Sorry, but it’s true. A copy is never as good as the original, come on! So this is book is an original in a sea of sameness and it’s very, very brave. Astrologers are often (rightly) criticized for calling events after they happen. Well Phil Brown has some ideas what Pluto’s transit through Capricorn (2008-2024) will bring and he’s telling us ahead of time. And he’s not being woo woo and vague about it, either. He speaks in plain language. Some of the stuff I agree with, some of it, I have no idea. But all of it is interesting and that’s what counts the most. The man knows his subject, I’ll tell you that. And he’s got a style of writing that has you feeling like you are watching something on TV. Do you ever watch the History Channel? You know how the History Channel takes some event or person in history and profiles it? They make the subject very accessible and interesting to non-history buffs and this is what Philip Brown does with his subject. He succeeds in making astrology feel real to the novice. 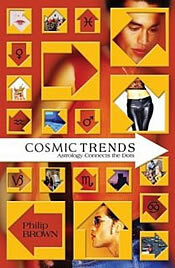 So if you want to know what is going to happen, why and what it means, check out “Cosmic Trends”. I don’t think you’ll be disappointed.